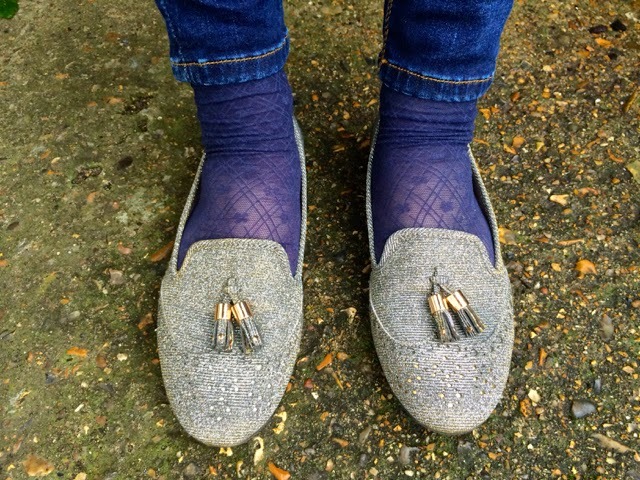 On Thursday I wore my sparkly tasseled loafers to work and they drew quite a reaction. So much so that I decided to blog about it. Here’s what happened. I got told they look like Essex shoes which is apparently where they believe I’m from at work. I’m not. It’s Surrey. My boss told me to write this blog post dedicated to them, so I am. Two friends asked if they were new as they hadn’t seen them before. They were correct-ish. I got them at Christmas from my cousin and auntie but it was their first time out of the box. One questioned my outfit choice saying that animal print, floral shirt and sparkly shoes was quite a statement all together. I should have said that was nothing, he hadn’t seen my snake-print skirt, striped top, pink socks and red glitter boot combo. That was quite a statement. They received several compliments in the ladies loos where they were at their optimal glitziest. And that ladies and gentlemen is why everyone needs glitter shoes. Fact. You can get your Dune Loki’s here. I get the same reaction when I wear my glittery brogues to work, which I really need to do more often!